This is a fantastic noodle dish with loads of flavour and which I always find deeply satisfying to eat. I’ve blogged it before, but it was a mixture of a couple of different recipes. This one here is the original, which I reproduce from Ms Dunlop’s book, which I recommend that anyone who likes Chinese food should buy. Add the oil to a seasoned wok over a medium flame and swirl it around. Immediately add the chillies and Sichuan pepper and stir fry briefly until the oil is spicy and fragrant. Take care not to burn the spices. Add the ya cai and continue to stir fry until hot and fragrant. Add the meat and increase the heat to high, splash in the soy sauce and stir fry until the beef is brown and a little crisp, but not too dry. Press the beef against the wok with your scoop or ladle as you go, to encourage it to separate out into little morsels. Season with salt to taste. When the meat is cooked (it should only take a couple of minutes), remove the mixture from the wok and set aside. Place the sauce ingredients in a serving bowl and mix well. Cook the noodles. Turn into a colander, rinse and drain, then place in the serving bowl. 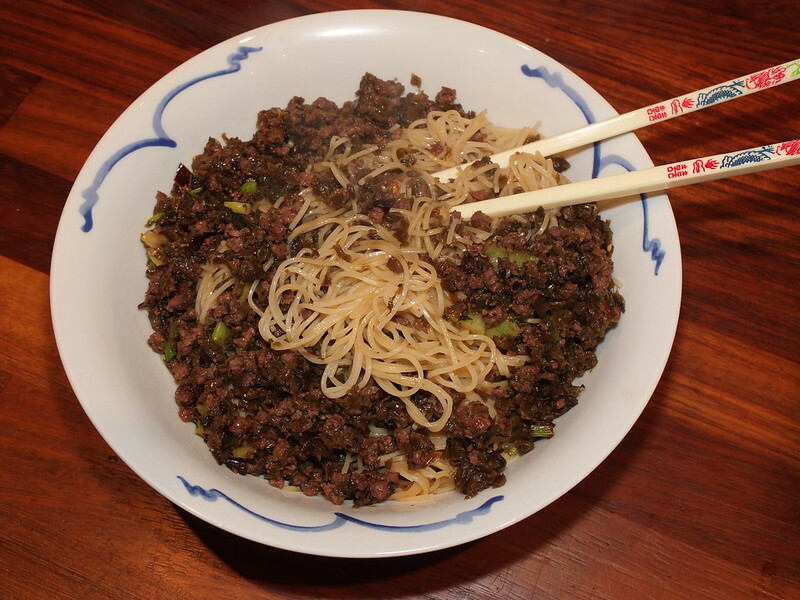 Sprinkle over the meat mixture, give the noodles a good stir until the sauce and meat are evenly distributed, and serve. The only difference here is that I added some chopped spring onions to the sauce, mainly because I like them.